A stunning design on this Brussels Point De Gaze fan leaf. It is always quite rare to find figurals like this in lace! A wonderful ornate scene, a young boy hunting with dog, and a lady threshing wheat. There are two other figurals, a young boy with a bushel of wheat and another picking grapes. A beautiful pastoral scene that seems to be celeberating the harvest and the hunt. 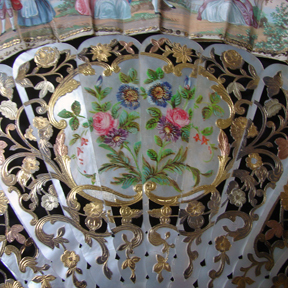 A elaborate Brussels Point De Gaze fan with a gilded shaped frame box. The Brussels lace design of large flowers, lilies, undulating scrollwork, vines and leaves is superb. 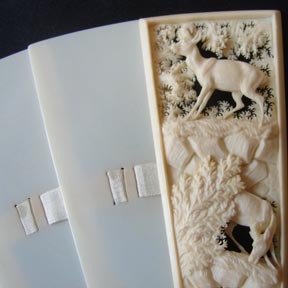 The mother of pearl sticks have fretwork and elaborate gilding. A beautiful fan for the discerning collector. A lovely Brussels Point De Gaze lace fan on luminous Mother of Pearl sticks, with a ornate design of scrollwork, fine needlelace fillings, and large roses with three-dimensional petals. There are approximately 24 roses. A beautiful and refined fan! Circa middle 1800's, this fine ivory brise fan has a superb guardstick, four stags are carved in high relief amidst a forest terrain. 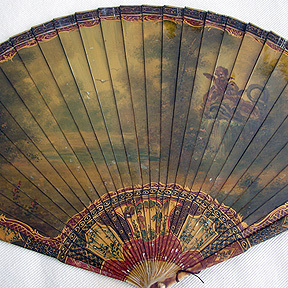 The fan appears in two books, including in the collection of the Cooper-Hewitt Museum. Circa 1800's, a very unusual Cantonese Mandarin fan with 120 figures with ivory faces. The white horse is very rare to find in these Cantonese fans. The ivory faces have been beautifully painted, with extemely fine and delicate work, and the costumes are quite ornate. 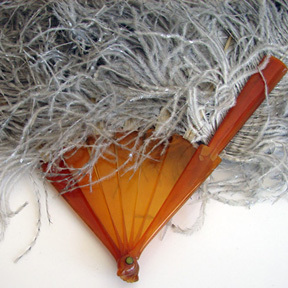 Circa 19th C., a very unusual Cantonese mandarin fan. The orange fan leaf is quite unusual and highly effective. The figures have fine hand- painted ivory faces. 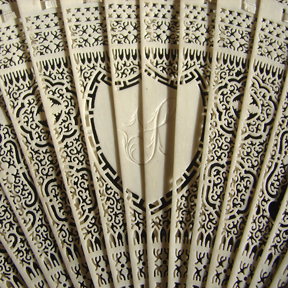 The fan is completed with ornated carved guardsticks. 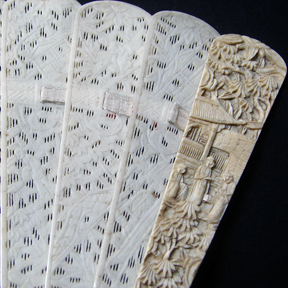 A pierced and carved ivory brise fan with fine, heavilly embellished guardsticks. 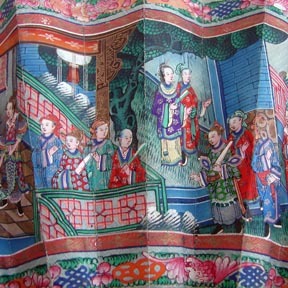 Oriental figurals in period dress, architectual elements, and finely done trees and leaves are in abundance. The sticks also have figural and architectual elements. A very beautiful 19th C. ivory brise fan with a central shield that contains a monogram. The sticks have fine delicate worked flowers and leaves. A special commission fan, the monogram is possibly an "R", but I am not certain. Measuring 7 1/2", the carvings on the fan are extremely delicate and beautiful. A stunning fan, circa 1800's with a superb design and excellent workmanship. Figurals in period dress on both sides of the fan, with courting couples, roses, musical instruments, and garlands of flowers. Elaborate decorations and tiny sequins surround the vignettes and the Mother of Pearl sticks are heavily guilded. The workmanship is exquisite. Circa late 1700's, A whimsical fan with a lovely design. Assorted figurals in period dress with ornate gilded decorative sticks. The design on the guardsticks has a guilded dragon. In the pastoral theme there are birds, vases, and undulating flowers and vines. A lovely fan! 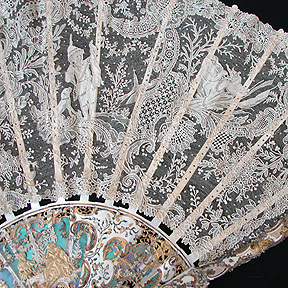 Circa 1880, an ornate Brussels lace fan with a lovely design. 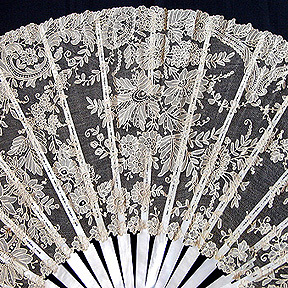 Bouquets of flowers are worked in bobbin and needlelace, and there are Point De Gaze vignettes on either side with masses of Point De Esprit scattered throughout the fan leaf. 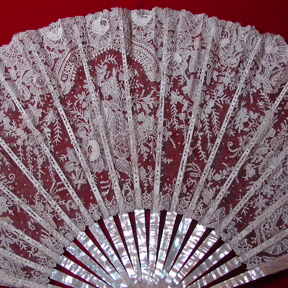 Circa 1860's, a very beautiful Brussels Point De Gaze lace fan with a excellent design and superior workmanship. A large central vignette of roses is surrounded by ornate scrollwork, meandering vines and leaves, and scattered Point De Esprit. There are apprx. 25 three-dimensional roses on this lovely fan, with additional hydrangas and other assorted flowers worked in this lovely whimsical fan. 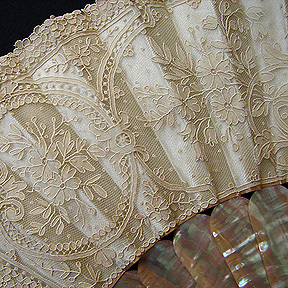 A gorgeous fan for the lace or fan collector. 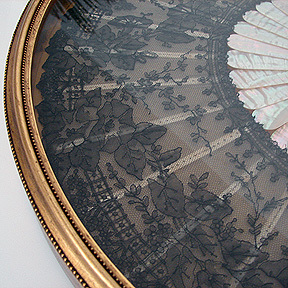 Circa 1860-80's, a beautiful Chantilly lace fan in a ornate fan case. The design is quite elegant , with meandering vines, leaves, and morning glories. The Mother-of-Pearl sticks are quite luminous. A lovely design and good quality workmanship. 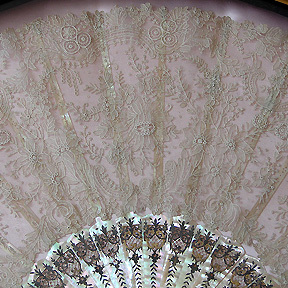 Circa 1860-80's, a elegant Brussels lace fan w/ Mother-of-Pearl sticks, with a design that is quite ornate. 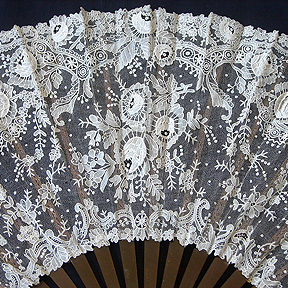 Trailing bobbin lace vines, flowers, and leaves in the design are further enhanced by the gentle scattering of Point De Paris throughout the fan. 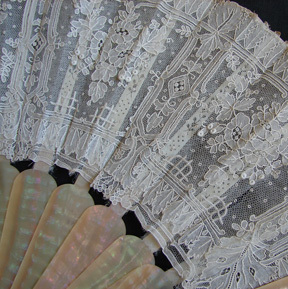 A lovely and large 19th C. Brussels Point De Gaze lace fan with Mother-of-Pearl sticks. The design on the lace is quite opulent, with masses of flowers, large floral sprays, and garland of flowers intertwine with ornate scrollwork. A very ornate and decorative fan! A beautiful fan that has come from a prominent new york estate. 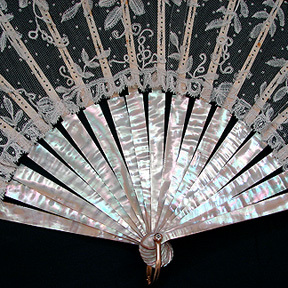 Circa late 1800's, the fan not only has a gorgeous fan leaf it also has superior Mother-of- Pearl sticks. The guardsticks have the most delicate carvings and filigree work. The fan leaf has the very best Point De Gaze lace, exceptional needlework and a superb design of scrolling vines, flowers, and leaves. This fan is quite luminous and as for quality, it is superb! 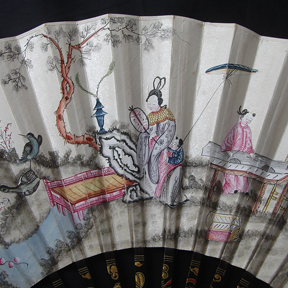 A rare and beautiful 18th C. "Vernis Martin" fan with ladies and gentleman in period dress enjoying the lovely pastoral landscape. There is a romantic couple on one side of the fan, architectual elements with a fountain, and a cherub in the landscape scene on the back of the fan. 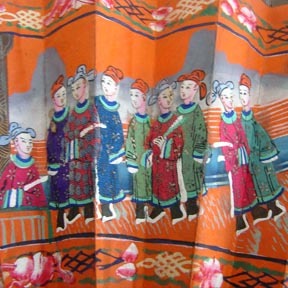 The guardsticks have oriental figurals painted amidst architectual scenes. A beautiful and rare fan! 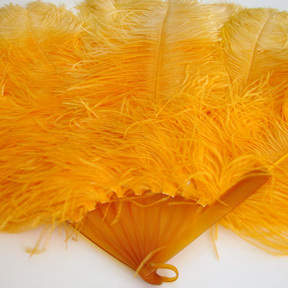 A beautiful ostrich fan with luminous orange feathers! The combination of orange feathers against the amber tortoise shell sticks is quite superb. Measuring apprx. 23" long. A lovely sparkle to this period fan! Tiny specks of silver paint bring a sparkle to the grey feathers. This lovely fan has amber tortoise shell sticks. A lovely period fan! A stunning combination of colors on this lovely fan. 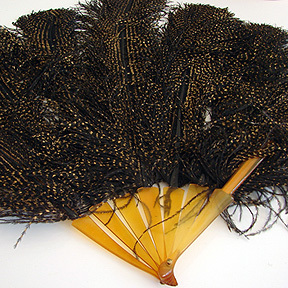 The ostrich feathers have been painted with gold flecks which give aluminous glow to the fan. Amber tortoise shell sticks complete the fan. A wonderful decorative period fan. 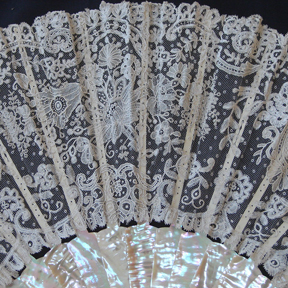 Late 19th C. Brussels Point De Gaze lace fan with mother of pearl fan sticks. The pearl sticks have a luminous hue. The fan leaf is highly embellished with floral bouquets and alternating scrollwork. Measuring almost 26" by 9 1/2 ". The fan is in overall very good condition, some minor age stains on outer edge of lace, and some light damage on lining.